Finding durable permanent markers for your needs starts with Markers 4 U, Inc. Our business provides a wide array of Sharpie permanent markers, including this king-sized selection. These fabulous selections are excellent for marking corrugate, wood, metal, and foil, as well as stone, plastic, leather, and other surfaces. 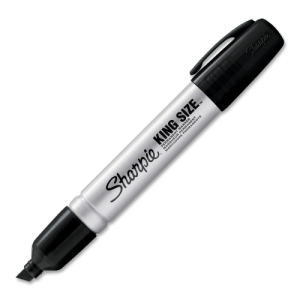 This Sharpie permanent marker also marks efficiently on wet and oily surfaces. For water resistant and quick-drying markers, you can count on Sharpie markers. They are ideal for people who need to make strong, dark marks that you won’t be able to miss.